Sultan Mutfak öncelikle yapıştırıcılar, kapatıcılar ve buna benzer kimyasal ürünler üretir. Özellikle buluş özelliği taşıyan yeni ürünler piyasaya sürer. 1996 yılında kurulmuş olan Sultan Mutfak çok çabuk, hem ulusal hemde uluslararası pazarda tüm kıtalara satış yaparak, dünya çapında kuruluşlara otomotiv, endüstriyel, ve perakende pazarlarında hem kendi hem de başka marka ürünleri ile yüksek başarı elde etmiştir. Bir aile şirketi olan sultan mutfak uzun vadeli iş ilişkileri kurarak sürekli bir büyüme içindedir. 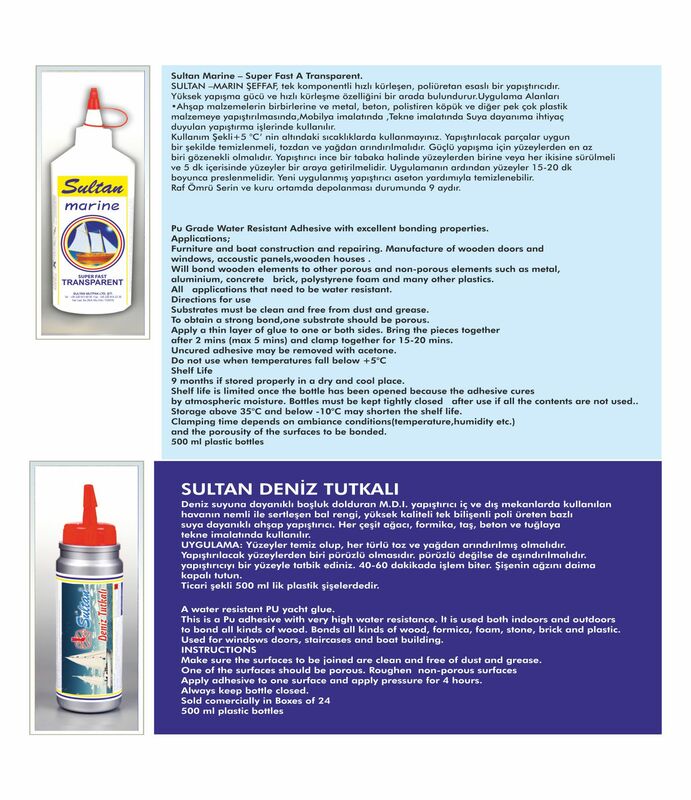 Sultan Mutfak is principally a manufacturer of adhesives, sealants, associated chemicals and innovative products. However, the extent of their service does not stop there. Although they have a broad range of products in the Sultan Mutfak brand they are predominantly specialists in branding products in their customer's name, commonly known as own branding. Sultan Mutfak also imports flatpack kitchen cabinets from the UK. These kitchen cabinets are in various sizes and models. A range of worktops and sinks are accompanied with the kitchen cabinets to compliment the whole kitchen. With their design and packaging expertise and extensive product range they are able to service and support customers in the Automotive, DIY, Industrial, Building and other specialised markets. The services they offer include product formulation, design and development, packaging design, photo-graphy, printing and artwork origination. These services are all in house giving them the flexibility required to provide you, the customer, with the right products in the right packaging for your market. 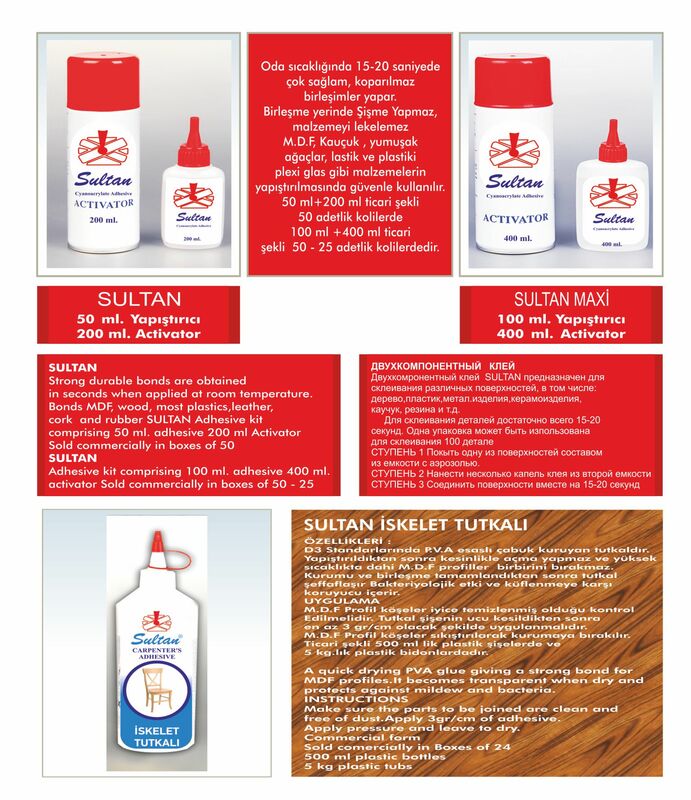 Formed in 1996 Sultan Mutfak has very quickly become a major Turkish and International success selling its products to all continents and providing many of the world's market leaders in the Automotive, Industrial and Retail sectors with own branded and Sultan Mutfak branded products. As a strong family business Sultan Mutfak continues to grow, building long term relationships, developing new and improved products, exploring new market opportunities and working with new people in all corners of the globe. The placing of Sultan Mutfak is also strategically thought out. The company is placed in Yalova which is in the middle of the triangle of the most industrialized cities of Turkey: Istanbul, Bursa and Kocaeli. With this strategic positioning, Sultan Mutfak is able to tap into these markets an provide a cost effective service.